The 2017 Volkswagen Golf Alltrack is a rugged, spacious wagon with crossover SUV vibes. It’s designed to withstand the toughest road conditions, or no road at all. Its 4MOTION all-wheel drive system automatically transfers torque between the front and rear wheels, adapting to varying road conditions. The standard turbocharged 1.8L TSI engine offers 170 hp and 199 lb. ft of torque so you can tow your boat when trekking outside of La Grange. Your gear has plenty of space too– maximum cargo space is 66.5 cu. ft.! Be active with the 2017 Volkswagen Golf Alltrack wagon. 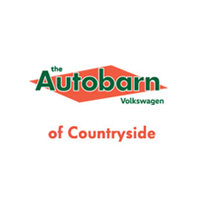 Why Choose Autobarn VW of Countryside? Here at Autobarn VW, we have the Volkswagen Golf Alltrack you have your heart set on. Active and interactive, the Alltrack is loaded with convenient and safety technology to keep you comfortable safe on your adventures. Bluetooth® connectivity, VW Car-Net App-Connect, and a rearview camera system is just the beginning. Visit us to see what makes the Golf Alltrack stand out from the rest of its class. You can also contact our finance department who works hard to get you competitive rates and quick approvals. Do it today!